Jignasa 2018 was quite a successful event - thanks to the support, participation by you. We also thank our sponsors for making the event possible. Stay tuned to the website and the Jignasa app for photos and videos from the event. We shall be uploading all sessions online. JIGNASA 2018 is blossoming on the Central college cricket ground, Bengaluru with all its grandeur! 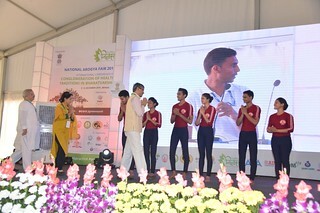 This time, based on the requests from Ayurveda, Yoga, Unani and Siddha (AYUSH) student community across India and students and supporters from other parts of the world, we have decided to organize an International Conference on “Conglomeration of Health Traditions in Bharatavarsha” and “International Arogya Fair 2018” as part of JIGNASA 2018 organized by Tarunya Shikshana Seva Trust and supported by Akhil Bharathiya Vidyarthi Parishad at Maharajas ground Bengaluru from 5th - 9th December 2018. Current scenario of Ayurveda and Yoga Education and Practice will be discussed. Prospects and Productive outcome will be the highlight. Live discussion and debate on the current AYUSH education in Bharatha and abroad – Students Perspectives.